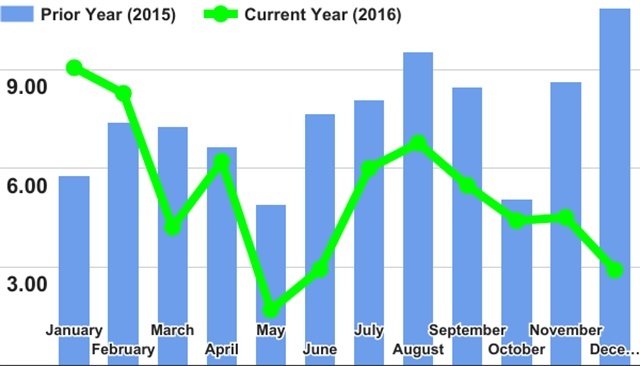 The FTR Trucking Conditions index declined in December, reflecting soft conditions that affected the industry in the second half of 2016. However, FTR is projecting a rebound in trucking conditions in 2017 as the result of a steady increase in capacity utilization that will tighten prices in the new year. The TCI fell to a reading of 2.9, down from 4.5 in November and 10.88 in December 2015. Despite the nearing positive turn, FTR expects the TCI to slide even further in January before it begins to register an uptick. Expounding on his remarks, Starks stated that trade, specifically among NAFTA members, was the most anticipated issue for transportation companies. Another key upcoming issue is the mandating of electronic logging devices later this year and the chance that the Trump administration could curtail or even remove the regulation. But that remains highly unlikely as transportation safety regulations have a history of bi-partisan support. With that in mind, FTR said it plans to monitor how small carriers implement ELDs into their operations over the next 9 to 12 months and how that could affect changes in capacity and rates.